I can't believe it's already the end of another week and the start of a fresh one! Paris seems like it was so long ago... and although I had an amazing trip, I'm pretty damn happy to be back in NYC. My last day in Paris consisted of throwing on this outfit, booking it to the Louis Vuitton show at 10AM, and taking a quick lunch break in the Marais (ok fine and maybe doing some shopping) before hopping into a cab in the rain, braving a ton of traffic (the normally 30 min drive took me and hour and a half!) and finally boarding a plane bound for NYC. Although this look is pretty casual, it's the accessories that make it special for me. These shoes were the perfect choice for a day spent primarily running around on my feet. They are so incredibly comfortable. Not to mention so incredibly cute. Most of my shoes are black, so they also add a nice pop of texture to any outfit. As for the necklace, it sets off the collared blouse without distracting too much from the rest of the ensemble. It's such a dainty and pretty piece, and I'm looking forward to layering it with other chains in future ensembles. And the bag is kind of vintage perfection. A great find (Micol)! Love this whole look!! Esp the shoes! I'm so jealous that you got to go to Paris Fashion Week. What an amazing time that most of been. amazing shoes!! Your coat is also fabulous. I love the coat. It has a really preppy tailored look. The bold shoes really make a statement because of the muted colors in the rest of the outfit. i really like the way you braided your hair! love the trench! so cute i love these pictures! your hair is awesome. i love the coat and your shoes, great style! First thing first I think you look amazing , love the trench coat paired with a simple white dress shirt, timless style! I really like how you made the look your own with your accccesories and shoes. 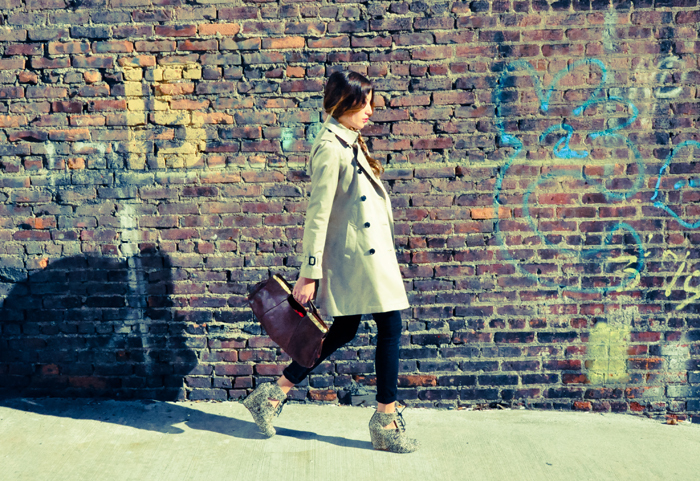 Im in love with everything in this look, your shoes, bag the trench, all of it! You look fantastic! Thank you for stopping by! Your photos are amazing and the two of you make a great team! I scrolled down and what amazing photos and experience at PFW! I am excited to read your next post! I love the look..you look so cool & edgy! just checked out your pictures you have an amazing style & interesting blog..Thanks for stopping by my blog! Great post :) Really enjoyed the pictures... you look beautiful! Love the photos, and the shoes are amazing!! I really love this blog! 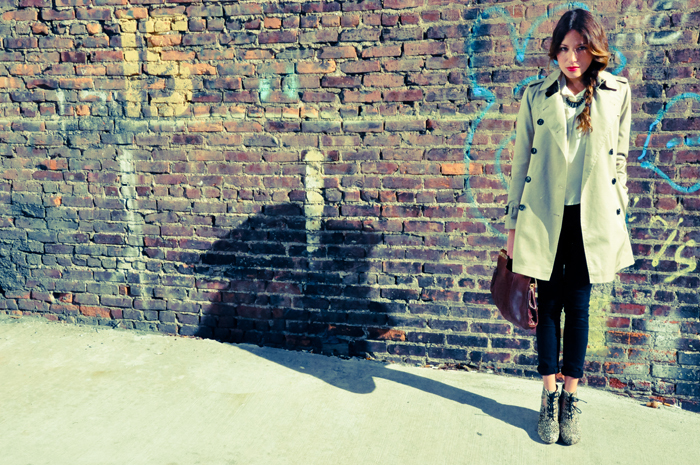 You have such great style :) I really like the trench and the bag in this post! 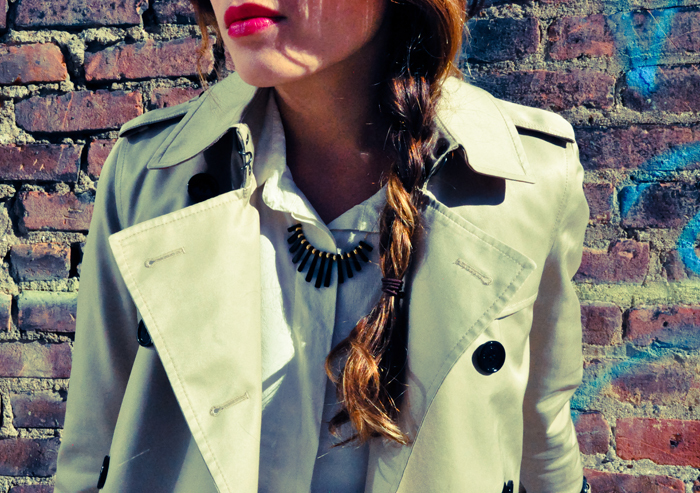 Gorgeous outfit, I love the Burberry trench and that necklace is gorgeous too! Love this look - its sooooo Paris! Which happens to be one of our favourite cities, so of course your photo has filled us with some nostalgia towards the city of love! the necklace and shoes are great! Wonderful trench and very nice shoes, you look great!